We have learned that ministry is simply planting seeds. Seeds of service, prayer, and conversation. These seeds take root and open a person’s heart to receiving the salvation that God provides. Sidewalk counseling has helped us realize this. Success can’t be determined by the number of lives saved, but by the opportunity to touch hearts, pray with these families, and pass on real help. This is Grace and Love, in a bag! This is the gift bag that we give to the women who come and go from the late-term abortion clinic Southwestern Women’s Options (SWO) in Albuquerque, NM. Inside is info for PDL, Care Net, post abortion help, and the Aspen Project (for adoption assistance), etc. It also contains tissue, a manicure kit, and warm cozy socks all for the women. A special thanks to Jennifer Bresett for making these. You never know what to expect on any given day, this month, Tara received two unique calls on the same day. One was from an active duty Albuquerque, Detective and the other was from a Sidewalk Counselor in San Diego, California. 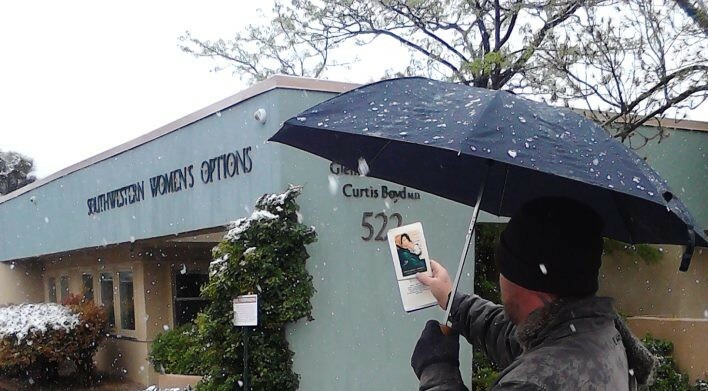 ~We maintained a peaceful, public, and prayerful presence at two of Albuquerque, NM abortion clinics. Ministry on a sidewalk gives us the opportunity to talk with people we would otherwise never meet. Many of these conversations deal with broken people carrying heavy burdens. Some of these people confronted us as their enemies but by the grace of God, God was able to use our conversations to Make Friends With Our Enemies, Harshest Critics (Fellow Christians), and even God Haters! ~ Countless babies were saved and moms helped! These mom’s and families were directly served thanks to the ministry of Project Defending Life. ~ Pastor Eric Lamb of the largest Christian Church in New Mexico (by attendance) Calvary of ABQ was inspired by our ministry and due to his leadership, he has held Pro-Life apologetics training classes, which has resulted in more Christians Standing For Life! ~ We continued our research and exposed that abortion clinics in NM operate with virtually no oversight from government agencies which places unsuspecting women’s lives at risk! ~We met with the Governor and presented our findings regarding the lack of oversight at NM abortion clinics as well as our concerns about tax funded abortions in NM, costing tax payers millions. ~The NM Medical Board investigated the fourteen 911 call complaints filed by Tara last year. Based on the investigation, one abortion violated the standard of care. Late-Term Abortionist Shelley Sella faced a Medical Board hearing to determine what, if any disciplinary action will be taken against her license. ~We continued to receive tips regarding abortion abuses taking place in Albuquerque abortion clinics and filed more complaints with the NM Medical Board. ~Local media outlets have covered the Medical Board investigations and have thus informed the women of NM to the dangers posed at abortion clinics. We have confirmed that women have chosen life instead of abortion as a result of this! ~Between the two of us we were on the radio numerous times and did several church and small group Bible study presentations. ~We worked closely with Operation Rescue doing investigations and publishing our findings. Our press releases were picked up by local and national media outlets. We’re thankful to everyone who helped make this year a success. Glory be to God! We appreciate all of the prayers lifted up on our behalf this past year. We are also so grateful for all of the encouragement and support we have received that has kept us going. 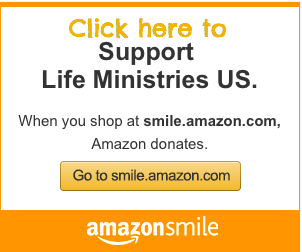 Thanks for partnering with us to save lives and further the kingdom of God. Here is our prayer request list, we know that God is going to do even more than we can imagine this year. ~For an end to abortion in New Mexico. ~For the conversion of every abortion doctor and clinic worker. 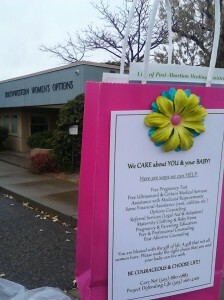 ~For softened hearts of the women we speak to each day at abortion clinics. ~For the moms who have already chosen life and for the means to continue to serve them. ~For a continued grace filled and Christ centered ministry focus. ~For more opportunities to share the truth about abortion and it’s effects with the Christian community. ~For the Christian community to rise up out of apathy and a spiritual awakening. We are full-time Pro-Life Missionaries and raise our own support from individuals who have a heart for our life saving work! Your generous support makes our work possible! Thank you for your continued prayers and support during these past 2 years of ministry here in ABQ. God is truly blessing our efforts here! We still have Pro-Life calendars available for purchase to support our ministry. These calendars were specially designed by a dear friend of ours to remind us how precious life is. It is a perpetual calendar to write in all of those special dates like birthdays, anniversaries and special events. Each month also features the picture of a beautiful ABQ newborn baby and a pro-life scripture. You will love owning this calendar and it also makes a great gift. You can purchase and view the entire calendar online here.